In many of our previous drawing lessons, we were asked to draw Kid Omega, the comic book character of the Marvel universe. For those who do not know, Kid Omega (Quentin Quire) is a mutant which has telekinetic abilities. So, let’s start the drawing tutorial on how to draw Kid Omega. 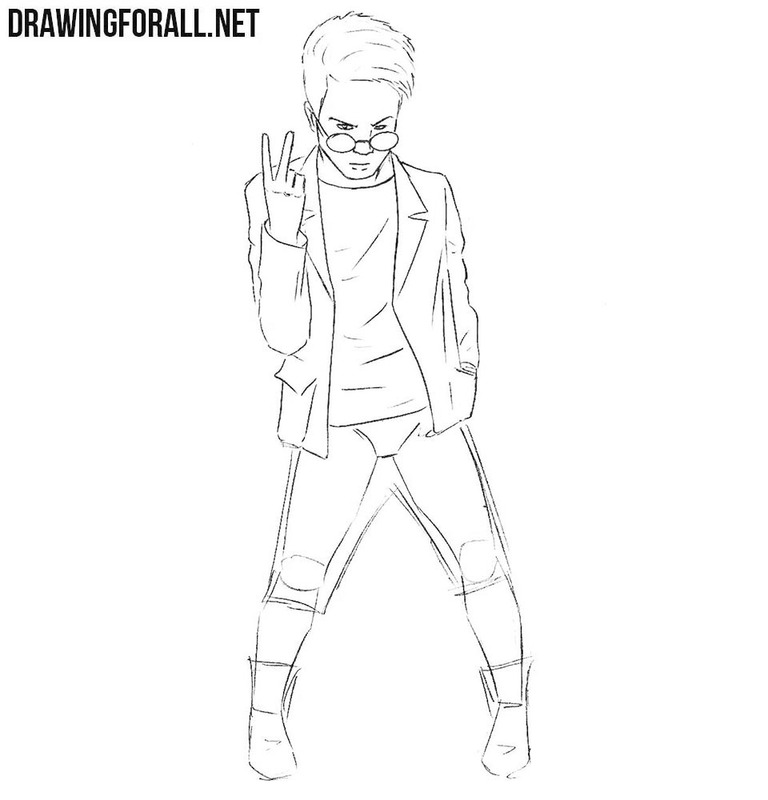 So, let’s start with the skeleton of Quentin Quire. First, we sketch out an oval head, then a line of the spine. On this line we sketch out thorax at the top and pelvis at bottom. Next, we sketch out the arms and legs using simple lines. At this step we will add some volume. We sketch out two intersecting lines on the head. 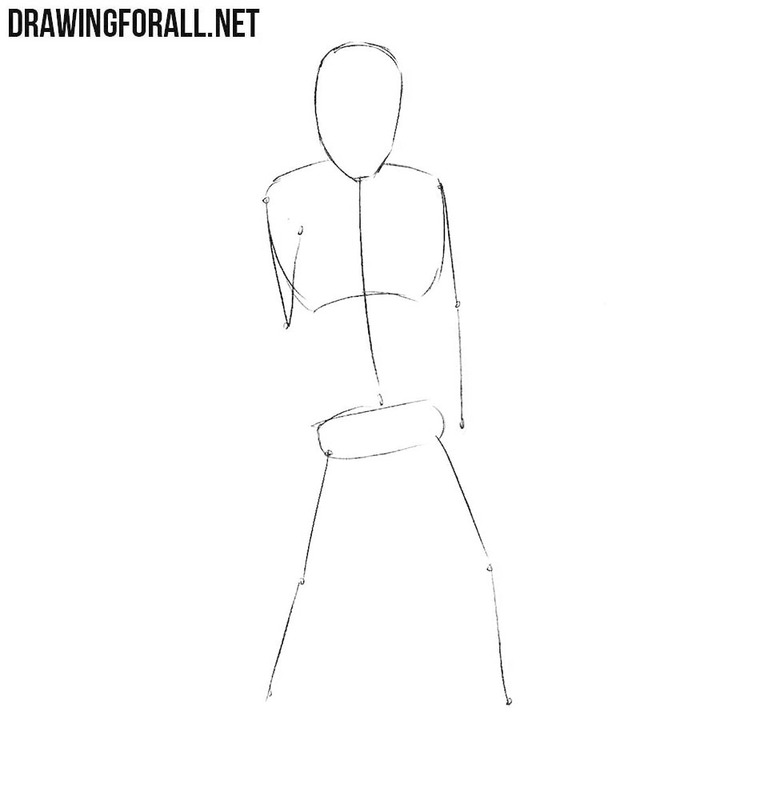 Next, we draw the torso, legs and arms with simple geometric shapes. Don’t forget to sketch out the hands and feet. It’s time to work with the most basic details of the drawing. First of all, outline the face details using light lines. 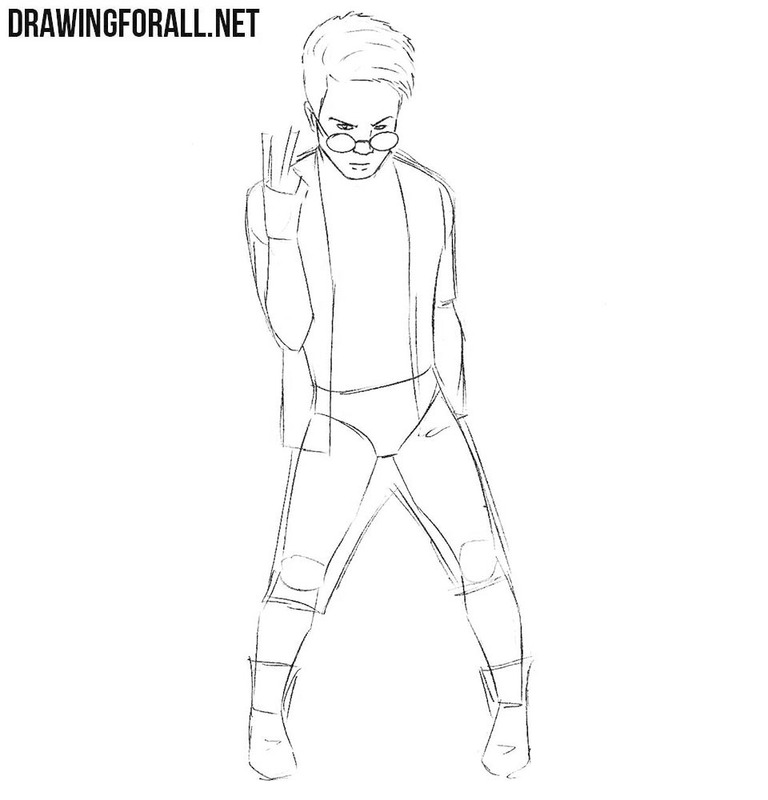 Next, we sketch out the hair and glasses. On the body sketch out the outlines of clothing, as shown in the example below this text. Starting with this step, we will start using clear and dark lines. 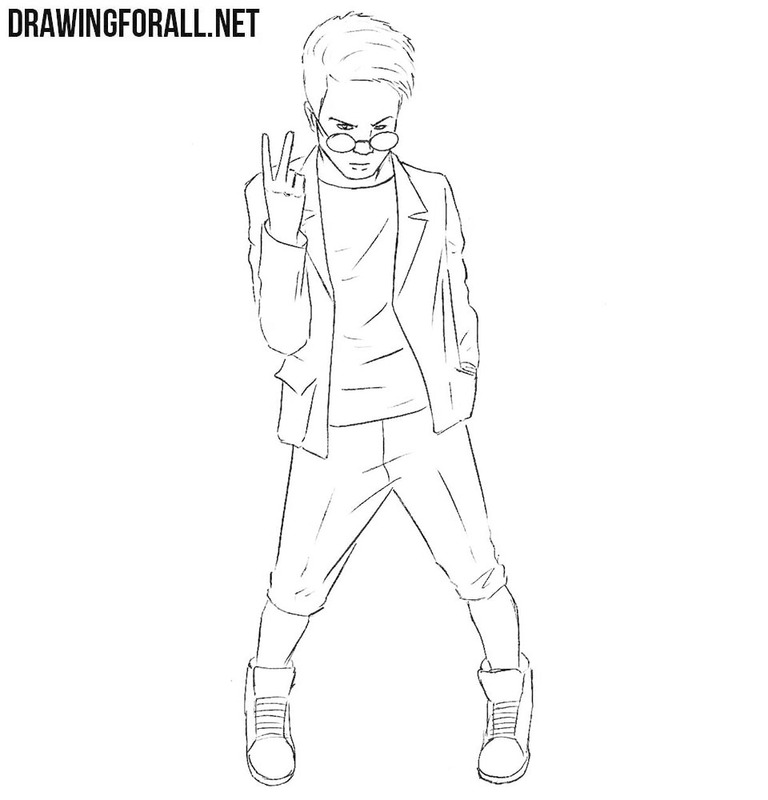 With their help, carefully draw out the outlines of the face, glasses and hairstyles. In the same step, draw out the outlines of the jaw, ears and remove all unnecessary lines from the head. Move a little lower and work with the upper body. Using clear lines accurately draw out the contours of the jacket and T-shirts under the jacket. 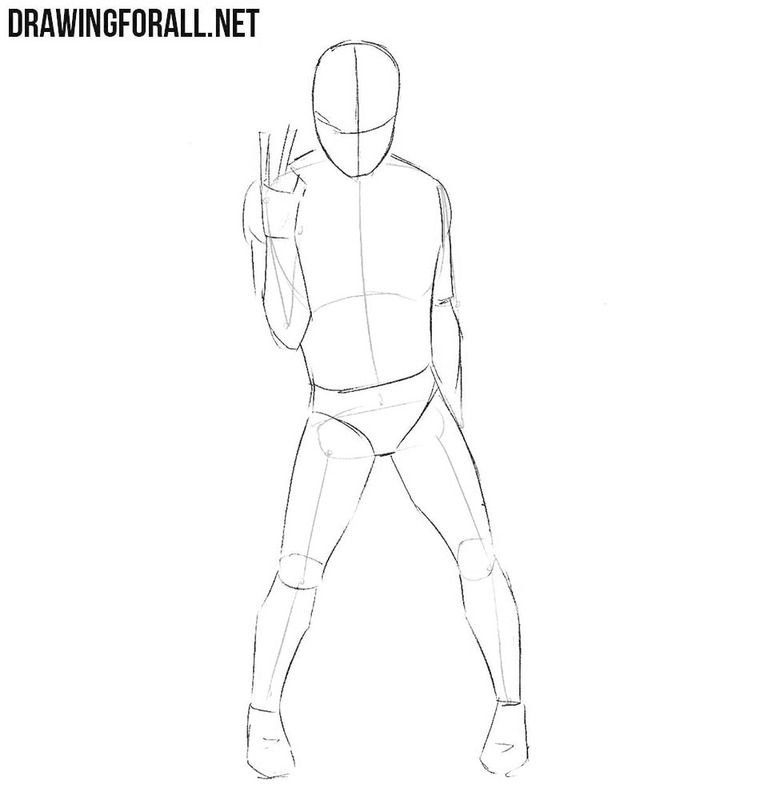 In the same step, draw the outline of the arms. Try to repeat all the contours and folds, as shown in our example. In the same step, we need to erase all unnecessary lines from the upper body. Now we need to repeat exactly the same operation, but with the lower body of Omega Kid. That is, using clear lines we need to draw out shorts, legs and shoes. To make it more realistic, mark a few folds on the shorts. By the way, do not forget to erase all the remaining unnecessary lines from the drawing. What should I do to make the flat drawing look more voluminous? Of course, you need to draw shadows. We will do this with dense hatching, adding them in the least-lit areas of the body of Kid Omega. But you can draw more dark and contrasting shadows, as in our lessons about comic book characters. So, today we showed you how to draw Quentin Quire, one of the characters from the Marvel Universe. 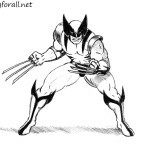 If you want us to draw your favorite character from comics, then let us know about it. Do not forget that we are waiting for your comments below our articles or in our social networks.